Pristine, Private, & Perfect Lakefront Home! Somerville Lake is located in the south central part of Burleson County and the north central part of Washington County, with the upper reaches of the lake extending into Lee County. The dam site is located on Yegua Creek, 20.0 river miles upstream from its confluence with the Brazos River. The normal lake pool elevation is 238.0 feet (above mean sea level) which encompasses 11,460 acres. There is approximately 85 miles of shoreline. Total land and water cover approximately 30,000 acres. Lake Somerville State Park Complex consists of four units: Birch Creek, Nails Creek, Lake Somerville Trailway, and the Somerville Wildlife Management Area. It is northwest of Brenham in Lee and Burleson Counties. Birch Creek is 2,365 acres in Burleson County on the north shore, and Nails Creek consists of 3,155 acres in Lee County on the south shore near the west end of the reservoir. The two units are connected by a 13-mile trailway system. The Somerville Wildlife Management Area (WMA) consists of 3,180 acres with the Yegua Creek Compartment in southwest Burleson County and the Nails Creek Compartment in northeast Lee County. The Somerville Reservoir was constructed by the U.S. Army Corps of Engineers. Work was started in June 1962, and deliberate impoundment of water was begun in January of 1967. The dam is located on Yegua Creek, 20 miles upstream from its confluence with the Brazos River, and about two miles south of Somerville. Somerville Reservoir covers 11,630 acres with a shoreline of 85 miles. Its main purposes are flood control, municipal water supply, and recreation. The state park complex was leased from the Federal Government in 1969 and opened in 1970. The Texas Parks and Wildlife Department manages the Somerville WMA under a license agreement and in cooperation with the US Army Corps of Engineers. Activities: Both units offer a multitude of recreational opportunities such as camping, picnicking, boating, fishing; hiking and biking, volleyball, horseshoes, basketball, backpacking, and equestrian use (visitors must bring their own horses). More than 20 miles of trail are open to hikers, mountain bikers, and equestrians affording visitors the opportunity to exercise and enjoy the beauty of the parks. Water lovers can enjoy boating, fishing, swimming, and skiing on Lake Somerville. Swimming: Can you swim in the lake? There are NO designated swimming areas at Somerville Lake! Swimming is at your own risk! Due to the un-level floor of the lake and fluctuations in the lake elevation, swimming can be hazardous. White bass anglers know this lake well as a high quality fishery, especially during the spring spawning run. However the lake offers very good fishing for hybrid striped bass, channel catfish and crappie as well. Largemouth bass fishing is very good with catches of fish up to 10 pounds plus. In March 2009, angler Richard Vela caught a lake record largemouth bass weighing 13.6 pounds and donated the fish to the Sharelunker Program, the first donation to the program from Lake Somerville. Both white bass and hybrid striped bass can be taken in the creeks in early spring, usually beginning in mid February. During summer and fall these two species can be found in open water following schooling shad. The area off Welch Park is particularly good just before the spring spawning run. Lake Somerville Marina and Campground is a family-fun place with 168 acres of wilderness campground and unlimited primitive camping. Our campground is equipped with over 93 campsites that include electricity and water, picnic tables and fire rings for roasting marshmallows and telling stories around the fire. We also have cabin rentals available that overlook the lake and make for a great spot to see the Somerville sunrise and sunset. At Lake Somerville Campground and Marina you can enjoy a beach area with swimming, two playgrounds, marina fishing, a pavilion for family gatherings and much, much more. 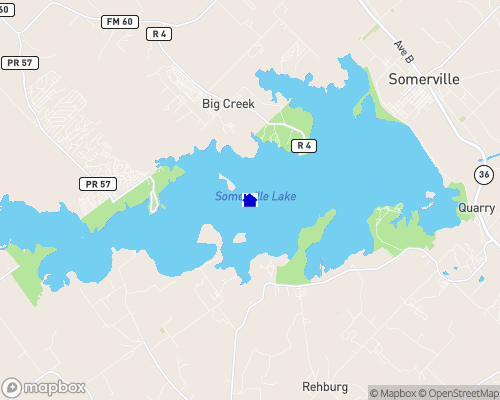 979-289-2321 Somerville Lake has a total of 11 boat ramps. The US Army Corps of Engineers at Somerville Lake offers both RV and tent overnight camping facilities. There are two (2) parks operated by the US Army Corps of Engineers, these include Rocky Creek Park and Yegua Creek Park. Rocky Creek Park is operated by the US Army Corps of Engineers year-round. Entrance to the park is controlled with a gate house complex (open from 6:00 AM to 10:00 PM, seven days a week). Camping Facilities 34 campsites with 20, 30, and 50 amp electric service and water hookups 40 campsites with 20 and 30 amp electric service and water hookups 75 non-electric campsites with water available 46 primitive campsites with water available. Yegua Creek Park is operated by the US Army Corps of Engineers year-round. Entrance to the park is controlled with a gate house complex (open from 6:00 AM to 10:00 PM, seven days a week).